Gelato is the traditional, Italian version of ice cream. It’s origins are lost in the mists of time, however everybody agrees that since ancient times humans enjoyed elaborate desserts of snow mixed with honey and fruit juices. The origins of the modern Italian Gelato can be traced back to the Florentine Renaissance where many of the current recipes were developed. 1. Gelato has on average 50-60% less fat than traditional ice cream but less fat does not mean less taste; our Gelato is full of flavour, creamier and has few calories! 2. 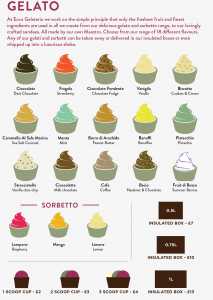 Gelato has a much higher density than ice cream Ice Cream manufacturers add air to ice cream because it nearly doubles the quantity of their product without increasing their costs. 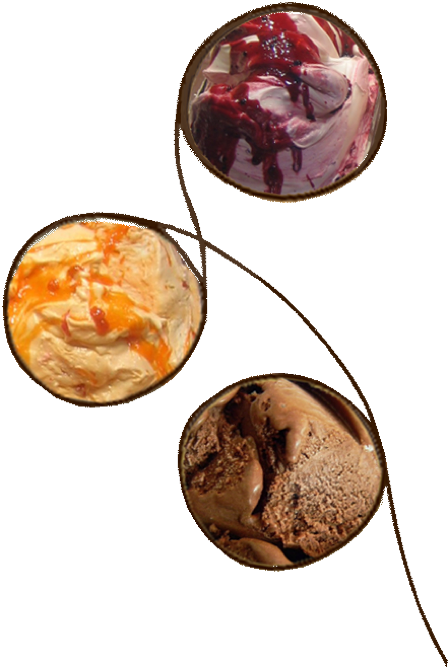 Unlike ice cream, very little air is added to Gelato resulting in a higher quality product with a rich and creamier taste. 3. Gelato is served at a slightly warmer temperature than ice cream. While both gelato and ice cream are served well below freezing in order to maintain their creamy consistency, gelato is typically kept at about 10 degrees warmer than ice cream. This results in a further enhanced taste as it melts in your mouth.